Motorola’s entire device lineup plan for 2017 has just been spilled out. Popular twitter-based tipster Evan Blass aka @evleaks has just leaked an image which shows all the upcoming Moto smartphones by the Lenovo-owned company. The picture, allegedly taken from an internal seminar room reveals nine Motorola mobiles which will launch this year namely, Moto C, Moto C Plus, Moto E, Moto E Plus, Moto GS, Moto GS+, Moto X (Moto X4), Moto Z (2) Play, and Moto Z (2) Force. 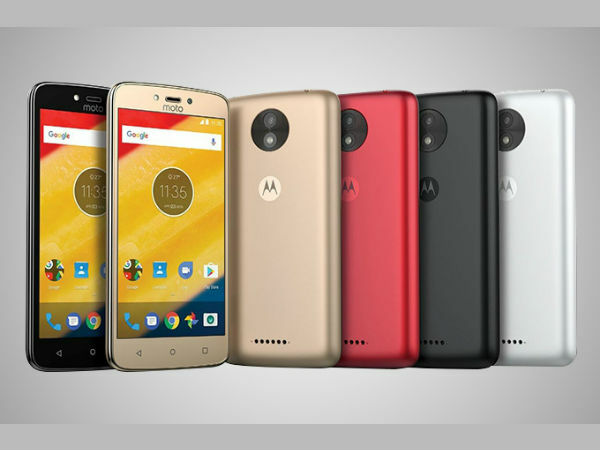 This is not the first time we are hearing about the 2017 Motorola Moto smartphones. They have been leaking repeatedly for the last few weeks. Below, we are briefly mentioning the things that we know about them till date. These are the cheapest smartphones from the Lenovo-owned brand. The Moto C and C Plus will come with 5-inch displays of up to HD (1280 x 720) resolution. The duo will pack entry level quad-core MediaTek chips along with 1 GB or 2 GB of RAM and 16 GB internal memory. The Moto C lineup will run Android 7.0 Nougat out of the box. Camera-wise, the phones might sport 5 MP or 8 MP rear shooter mated with a 2 MP selfie unit. The Moto C Plus will reportedly rock a huge 4000mAh battery while the Moto C will settle with a much lower 2350mAh cell. The Moto E4 series is going to sit just above the Moto C series. The 4th generation Moto E will sport a 5-inch 2.5D HD (1280 x 720) display. A quad-core 64-bit MediaTek SoC will power up the smartphone. A 8 MP or 13 MP camera is expected to sit at the back of the Moto E4 along with a 2 MP selfie shooter. On the other hand, the Moto E4 Plus will come with a larger 5.5-inch HD (1280 x 720) screen. It shall also boast a fingerprint scanner embedded into the home button. A gigantic 5000mAh battery is expected to juice up the upcoming smartphone. Apart from these, the Moto E4 Plus would be similar to the Moto E4. The duo will reportedly come with Android 7.0 Nougat pre-installed. 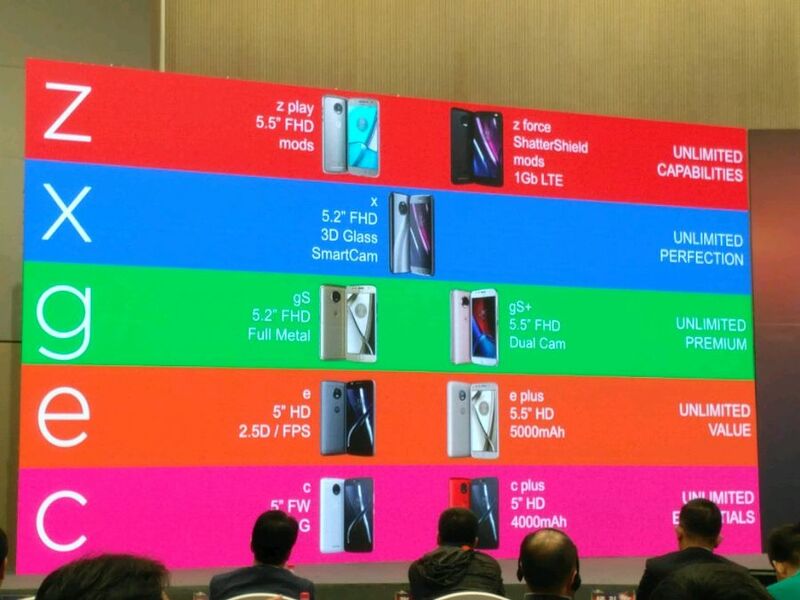 This is the very first time that we are hearing about the Moto GS lineup. This is expected to be a minor upgrade to the Moto G5 series. The Moto GS will reportedly come with a 5.2-inch Full HD (1080 x 1920) display and a full metal body. The Moto GS+ is expected to rock a larger 5.5-inch Full HD screen with a dual camera setup. Lenovo is going to place the Moto X4 just beneath the flagship Moto Z series. The smartphone will pack a 5.2-inch Full HD (1080 x 1920) display. The Moto X4 is expected to boast a premium metal body covered with a 3D glass. It will sport a Snapdragon 660 SoC along with 4 GB of LPDDR4 RAM and 64 GB of onboard storage. 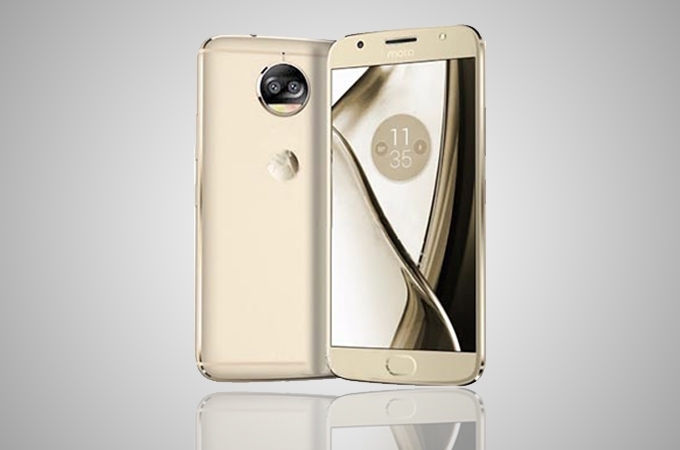 The upcoming Moto X will rock a dual lens rear smart camera. It is going to come with IP68 certified water and dust resistance. The phone will pack a 3800mAh battery with turbocharging capability. These are going to be the most premium smartphones from Motorola. The Moto Z2 Play is going to sport an impressive 6 mm thin body. A 5.5-inch Super AMOLED display will sit at the front. Inside, the Moto Z2 Play might pack the latest Snapdragon 630 chipset. This will be mated with 4 GB of RAM and up to 64 GB of inbuilt storage. On the other, the Moto Z2 Force will boast 5.5-inch ShatterShield screen along with a sturdy exterior. It is expected to get fuelled by the mighty Snapdragon 835 SoC. This will be mated with 4 GB or 6 GB of RAM along with 64 GB of onboard memory. It might also rock a dual camera at the back. Both the Moto Z2 Play and Z2 Force will support Moto Mods. While there is no specific release date of all these smartphones, we presume that it is not far away. The 2017 Motorola Moto smartphones might go official within the next couple of months.